I, unlike some, have the wonderful joy of having three days off a week from my full-time job at the local city. Being a full-time student, full-time employee, and just starting a small graphics & screen printing business, it’s hard to sit down and find time for yourself and what you like to do. With my love for repurposing, upcycling, and giving life to old things it seems to be especially time consuming in some ways. I love to peruse the aisles of flea markets and fairs, stop at garage and yard sales, and am even attracted to ornate things laying out at the end of driveways. On my way to my doctors appointment this morning I heard an ad on my favorite syndicated radio show. The local convention center is holding an Antique and Vintage show today! And not just today…but all weekend! I am excited to be going and am hoping to find at least one unique thing to bring home with me. If I can’t find anything, I am still pleased to be going because there isn’t too many good finds very often living in a military town and the constant hustle and bustle of a young city. The city itself has only been established for about 45 years and is constantly changing. Old farms have been turned into shopping centers, fields have given way to developed neighborhoods and so on. Many of the military folks have also with held their want for many things because of the possibility of movement every so many years. I have also thought about travelling to a nearby city and seeing what it has to offer. It’s a waterside city and has had an array of different businesses large and small, worldwide and stateside. Not to mention the old houses are also cool too! I will have to keep an update on ornate finds and crafty things I do. 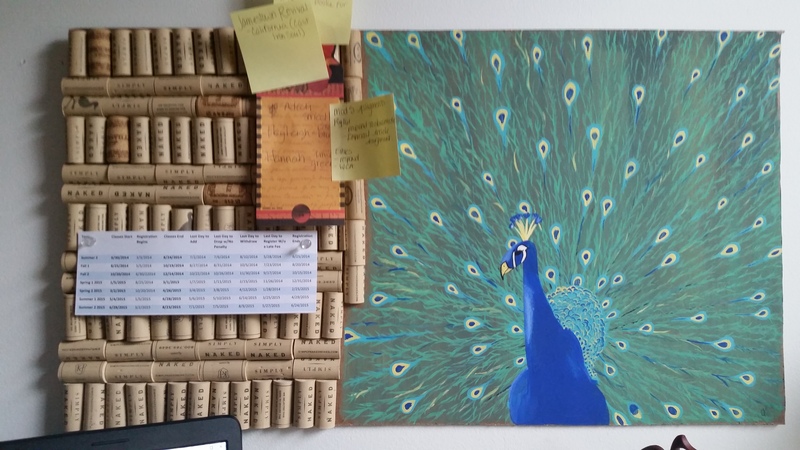 I have recently fashioned up a cork board made out of wine corks and pressboard with a beautiful peacock painted on it and hung it above my desk I repurposed out of an old aquarium stand and 1×6’s. Enjoy your day everyone. I’m off to the antique show! This entry was posted in Art, Inspiration, Musings of Life, painting. Bookmark the permalink.